I would first of all like to say that the Lightning are building something great down in Tampa. They’re building the type of team that is getting ready for a long run of success in the NHL. A team that can beat you in a lot of different ways: with speed, skill, grit, defense, goaltending, and special teams. I think the Lightning have one of the best mixes in the NHL of veterans, players that are leaders in the locker room and still very young, and then young kids and rookies. It is probably a very fun team to be a part of. Today we are going to take a look at my rankings of the 5 best players on the team under age 25. Some of these players are already established stars on the team are only going to get better in the upcoming years, which means the rest of the league is going to have to take notice. When your stars are not even in their prime yet it creates a lot of optimism for the team, personnel, and fan base. No team in the NHL has a better group of young contributing talent then the Tampa Bay Lightning. First we will look at 3 players that just missed the list. Drouin missed the list not because he does not have the talent to be on it, but because he just arrived to the Lightning last week. He already looks like a kid who in terms of hockey ability is mature well beyond his years. He has not just held his own in his first week in the NHL but he has excelled at times and shown flashes of potential greatness playing with Steven Stamkos and Valterri Filppula. There is a very good chance you will see Drouin on this list at the end of the season. The Tampa Bay 3rd line for most of the season has featured two 21-year-old Russian prospects. The line has been good this year with fellow Russians and 2011 1st and 2nd round picks Vladislav Namestnikov and Nikita Kucherov. The two play well together. Namestnikov is a two-way center that is developing his game still and has 2 goals, 1 assist, and 3 points this season in 10 games. He played two seasons for the London Knights and averaged over a point per game before putting up very respectable numbers in the AHL last season with the Syracuse Crunch. Namestnikov had 19 goals, 29, assists, and 48 points in his first 56 games last year as a professional. His winger Kucherov is also developing into a very good player. 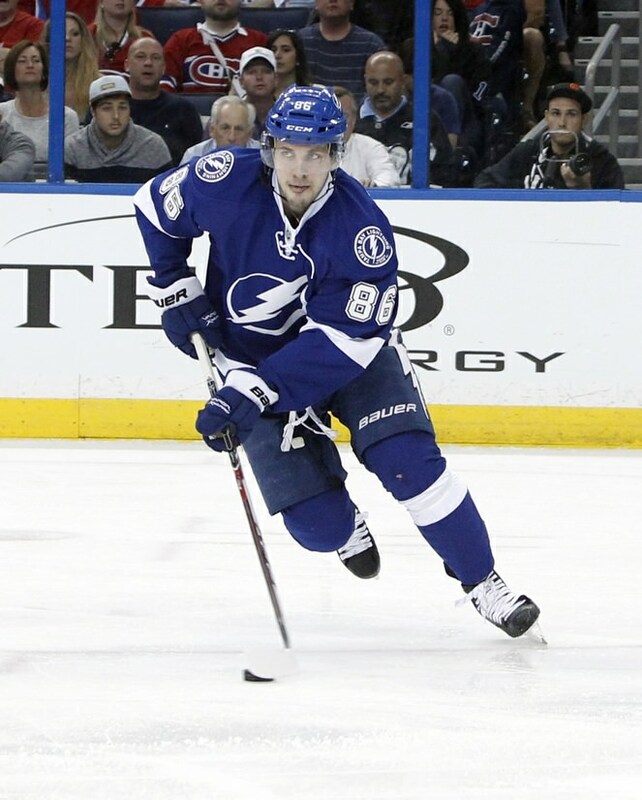 Kucherov has the speed and raw offensive talent that is still a work in progress as well. Kucherov also has a North American style game having played in the QMJHL. Kucherov has 4 goals, 5 assists, and 9 points this season in 10 games. He is one game removed from the best game of his young career where he was moved to a line centered by Tyler Johnson and scored his first career hat trick. With the high level of play from these three rookies, the Lightning could have three legitimate scoring lines once they get healthy. We now are going to transition from the young players and kids with great upside to the Top 5 Players on the Lightning under age 25. The 24-year-old from the Czech Republic is clearly not known for his offensive prowess. However, every NHL team would take a player like Gudas in their lineup. This guy loves to hit and get under the skin of opposing players. Every player on the other team has to be very much aware of when Gudas is on the ice. He hits, blocks, shots and plays a physical brand of hockey that is unique. He is an intimidating presence and will continue to improve as a hockey player. Gudas can play on my team anyday. The 24 year old 5’ 9 center from Spokane, Washington once scored 115 points in the Western Hockey League and went undrafted. It was rumored to be because of his physical stature. Johnson signed as a free agent with the Lightning following his Junior Hockey career in 2011. After paying his dues in the minors with two successful seasons in the American Hockey League, Johnson had a rookie season to remember last year. He was a rookie of the year finalist scoring 50 points and earning a plus 23 +/- rating while appearing in all 82 games. Johnson is an excellent skater, holds his own on faceoffs and is developing an all around game. He is off to an even better start this year and has 1 goal and 11 assists in only 10 games. Johnson is becoming an extremely valuable 2nd line center. The 23 year old went undrafted his first two years of eligibility before being taken in the 7th round in 2011. 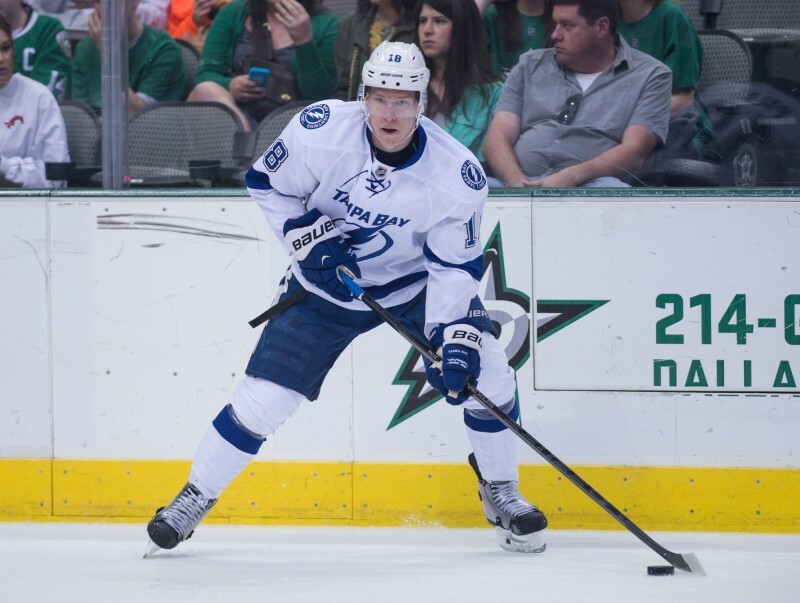 Palat can become an elite playmaker and has shown he can score as well. Palat was a Rookie-of-The-Year finalist along with Tyler Johnson last season after he scored 58 points in 82 games and was a plus 25. Palat can simply play the game of hockey at a high level and can play anywhere in the Lightning lineup and contribute effectively. Look for Palat to elevate his game even further this year and put up 60-65 points. The 6’6 23 year old Swede enjoyed his breakout campaign last season with 55 points in 75 games. Hedman finally got power play opportunities he was looking for and excelled. He skates like the wind and can play in a shutdown role. Hedman was leading all NHL defenseman in points though 5 game until he was sidelined with a fractured finger. Hedman plays in all situations for the Lightning and will continue to establish himself as a star defenseman when he returns to the lineup. The captain of the Bolts is only 24 years old and already has a 45, 51, and 60 goal season on his resume. He is the best goal scorer in the National Hockey League. Stamkos is the leader of the team and is a scoring threat whenever the puck is on his stick. He possesses the best one-timer in the NHL on the power play and if the Lighting are going to go far this year, they need Stamkos to play like the pure sniper that he is.